We’ve been looking around and doing some “internet research”, and there is a lot out there about the most common causes of back pain. But we’ve found many of the lists conflict, not just with the data and what we know, but with each other. And some lists we’ve found are 14 and even 25 reasons long! There can’t be 25 “most common” reasons for low back pain. While back pain can be complicated and there are many causes, the most common reasons are, well, the most common. So, here are the top 3.
allows you to bend and move your spine, as well as maintain your height, is really more like a jelly doughnut, just with a much tougher outside but still with a jelly-filled center. Herniated disks are really a sprain, a stretch, tear, or injury, to the ligamentous material, that tough outside, that connects one vertebral body to another. Disk herniations frequently happen with bending forward and twisting. Bending forward loads the disk with the weight of your body and anything you’re carrying. The twisting puts torsion on the tough outer material, straining and stretching it. This combination can cause the disk to get irritated or “fail”. Pain often occurs and increases with bending forward or prolonged sitting. The injured disk, and resulting inflammation, may create irritation to the nerve roots and sometimes produces pain, tingling or numbness down the back of the thigh and leg. Stenosis is a word from modern Latin that means “abnormal narrowing of a passage in the body”. Foramen means “an opening, hole, or passage, especially in a bone”. The spinal foramen are the holes your nerve roots exit through to send and receive signals to and from your muscles, joints, and skin. Foraminal Stenosis just means these holes are narrowing. This can occur as a result of too many, or severe, disk herniations, bony build up, chronic irritation and inflammation of the facet joints, and wear and tear. Stenosis occurs quite commonly with advancing age. This kind of stenosis can cause compression, friction, and irritation to the nerve roots and in turn may produce pain, tingling or numbness down the thigh and leg. Irritation to the facet joints can cause centralized low back pain. All of these symptoms are often aggravated by walking, especially when transitioning from sitting to standing & walking, working overhead, or standing, like when waiting in line or cooking a meal. There is good news here, too. The symptoms resulting from stenosis can also be treated and managed, often without surgery. This is the trickiest one of the three. 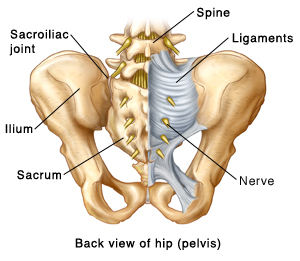 SI, or Sacroiliac, joint problems don’t usually show up on an MRI or X-ray. At least not until they have progressed a long way. And some people think that because they can’t see it on a diagnostic film, it doesn’t exist. In fact there is much MRIs and X-rays don’t show, especially early on. SI joint problems can be a result of prolonged sitting like on a long flight, especially if twisted or a little off center. They can also be the result of a fall or of lifting something really heavy. It is very typical for the symptoms to slowly build or suddenly appear, unrelated to the activity that caused the problem This only adds to the trickiness of figuring this one out and solving the problem. Symptoms typically include pain, and sometimes “feeling a little off”. In addition to the pain, people will sometimes complain of feeling like they are twisted, off kilter, or their hips don’t feel quite right. The pain can be very focal around the low back or tailbone, or it can travel down the thigh & leg. Sitting and changing positions may exacerbate the pain, but it does not always follow this pattern. Sometimes lying down on the wrong side or flat on your back can even aggravate it. This one is truly harder to figure out. Assessing this issue requires movement observation and movement testing, particularly looking for asymmetries of movement and position, as well as reproduction of symptoms during the examination. Upon successful assessment, solving SI joint problems becomes much easier. The treatments may sound similar here, and they are, at least in their foundation and theory. Mechanical problems are best addressed with mechanical solutions. What those specific mechanics, exercises, positions, and postures are can vary a good deal depending on the nature of the root problem and cause. It is not uncommon for the stretches, or strengthening exercises to be the exact opposite for different problems. Tailoring the treatment to each individual’s goals and limitations is a key component of a successful treatment plan. Stay active! Keep moving. We want you to be and stay healthy. We hope this is useful to you and maybe to someone you know. Please share if you think it might be. And if you need us, we’re here to help. You can view, download, and share your very own eBook version of this article by completing the form below. We want to help with your musculoskeletal patients.